Crystal meth is an illegal street drug made in labs by combining different chemicals and medications sold over-the-counter, including cold medicine. The drug is cheap and provides a quick, powerful high, which makes it attractive to users. Casual use of crystal meth can quickly lead to addiction and a variety of serious health and social problems. In its pure form, crystal meth is a clear to white crystalline substance that resembles long, thin shards of broken glass. Crystal meth is a highly addictive stimulant made by combining a variety of toxic chemicals and over-the-counter medications. It is most commonly smoked, injected or snorted. The duration of its effects depends on how it is used. Effects of crystal meth include euphoria, increased alertness, decreased appetite and insomnia. Over time, users can develop a number of mental and physical health problems including psychosis, “meth mouth,” depression, weight loss, violent behavior and even death. Withdrawal symptoms include depression, anxiety, fatigue, intense cravings and suicidal ideation. More than 1.5 million people are addicted to crystal meth in the U.S., and it is one of the hardest addictions to treat. Manufacturing 1 pound of crystal meth produces almost 6 pounds of toxic waste. Most of the crystal methamphetamine used in the United States comes from “superlabs” in Mexico. But many small home labs are in the United States. In fact, crystal meth labs have been discovered in all 50 states. The main chemical used to manufacture crystal meth is ephedrine or pseudoephedrine, which is found in over-the-counter cold and allergy medications but can also be obtained in bulk from an illicit market. As a result, the federal government closely regulates products that contain ephedrine or pseudoephedrine. The manufacture of crystal meth uses a host of toxic chemicals such as anhydrous ammonia, sulfuric acid, hydrochloric acid, red phosphorus, lithium, sodium metal, iodine, mercury and toluene. It is estimated that manufacturing 1 pound of crystal meth produces almost 6 pounds of toxic waste. As a result, hazardous vapors can accumulate in the “labs” and cause explosions. The popular TV show “Breaking Bad” focused on the manufacture of crystal meth, while the movie “Spun” looked at a group of crystal meth users in Los Angeles. Many different options are available for treating crystal meth addiction. Figuring out which type of treatment is the best for you means doing a little research beforehand and getting more information about how crystal meth abuse is treated. 12-step recovery programs. The 12-step program specifically for crystal meth users is called Crystal Meth Anonymous. Another program, Narcotics Anonymous, welcomes anyone struggling with a drug or alcohol addiction. Outpatient rehabilitation centers. An outpatient program is for people who are transitioning out of a residential program into a lower level of treatment or who have a less severe addiction. You come to the treatment facility on certain days of the week and attend group or individual therapy sessions. Outpatient programs may also offer detox. Inpatient programs provide a high level of care and support for people who have a serious addiction to crystal meth or have tried another program and relapsed. You remain at the rehab center throughout the course of your treatment and attend individual therapy, group therapy and addiction education groups. These program also offer detox and medical care. Dual diagnosis recovery centers are for people who have a crystal meth addiction and a co-occurring mental health disorder such as depression, schizophrenia or a personality disorder. Many people who become addicted to crystal meth either have a mental health disorder or may have developed one from long-term crystal meth use. Whether the program offers special amenities such as horseback riding, massage therapy or tennis. With insurance; Speak to a treatment representative at 1-888-319-2606 Who Answers? to learn more about which recovery options your insurance will cover. Without insurance; The Substance Abuse and Mental Health Services Administration’s toll-free helpline can help you find a local rehab program if you don’t have insurance. Crystal meth is most commonly smoked, injected or snorted. When smoked, it is usually done in glass pipes similar to how crack cocaine is used. On average, the full effects of the drug occur within minutes of snorting. Effects are felt nearly instantaneously when smoked or injected. 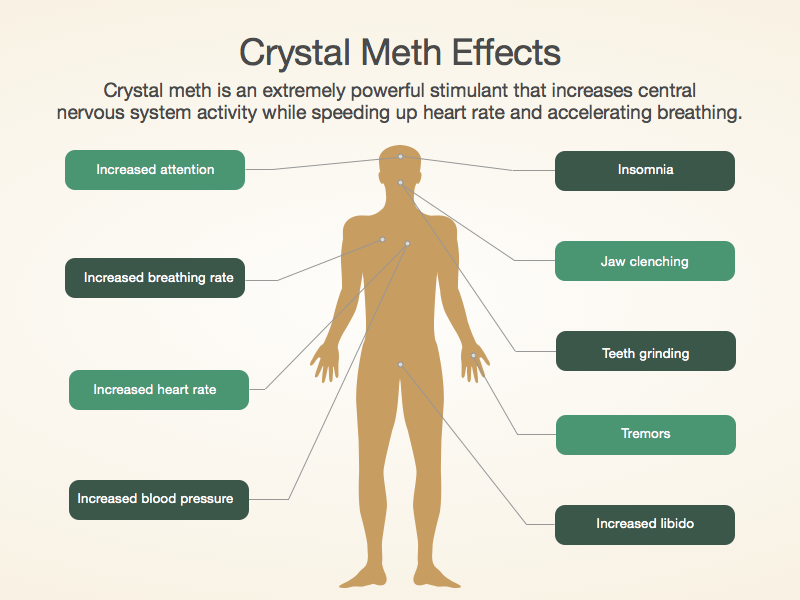 The duration of crystal meth’s effects depends on how the drug is used. If it’s injected or swallowed, the effects can last 6-8 hours. 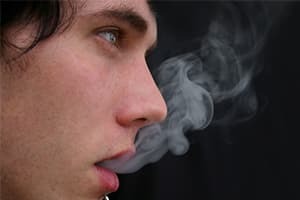 If it’s smoked or snorted, the effects can last up to 12 hours. Increased heart rate (tachycardia), body temperature (hyperthermia), breathing rate (tachypnea) and blood pressure (hypertension). Muscle breakdown (rhabdomyolysis), which can lead to kidney failure. Hyperthermia (extremely high body temperature). Teeth grinding (bruxism), causing tooth wear. Tolerance (needing more of the drug to get the same effect). Some acidic contaminants in crystal meth—such as antifreeze, drain cleaner, lantern fuel and battery acid–can erode tooth enamel with frequent use. Users commonly grind and clench their teeth, damaging surface enamel. Dry mouth from crystal meth use deprives teeth of protective saliva and can result in a condition known as xerostomia. This further sets the stage for cavities, acidic erosion and a variety of oral infections. Users crave sugary drinks and frequently expose their teeth to sugary acids. Crystal meth addiction is one of the hardest addictions to treat. Crystal meth addicts who go to rehab have a long-term success rate of just 12%, which means they have an 88% relapse rate. No medications are approved for the treatment of crystal meth addiction. Learn more about how to find a crystal meth recovery program. Users who are trying to quit should seek medical supervision during withdrawal. Intense craving for crystal meth. The symptoms of crystal meth withdrawal will usually appear within 72 hours of stopping use. The first phase of withdrawal is intense and lasts anywhere from 7 to 10 days. The cravings for the drug peak around 3 months and decrease substantially by 6 months. Long-term cognitive effects from methamphetamine use show significant improvement after 1 year of abstinence from the drug. Who Answers? for more information on crystal meth addiction treatment options for you or your loved one. People who are addicted to crystal meth may exhibit a number of signs and symptoms. If you or someone you love displays 2 or more of the following symptoms within a year, you may have a problem with the drug. Wanting to reduce or stop use of the substance but not managing to. Spending a lot of time getting, using or recovering from use of the substance. Not managing to do what you should at work, home or school because of substance use. Giving up important social, occupational or recreational activities because of substance use. Crystal meth abuse is common in the United States and abroad. According to the World Health Organization, methamphetamines (including crystal meth) are the most widely abused illicit drugs after cannabis. Worldwide, more than 35 million individuals regularly use or abuse these drugs.1 People who become addicted to methamphetamine typically inject or smoke the drug and use it at least twice a week. Rates of Abuse in the U.S.
0.2% of participants age 12 or older. 0.2% of participants ages 12-17. 0.2% of participants ages 18-25. 0.2% of participants ages 26 or older. It is possible to overdose on crystal meth. Users can overdose on relatively small doses, too, especially when they combine crystal meth with other drugs or when they have pre-existing medical conditions. If you suspect crystal meth overdose, call 911 or visit the nearest emergency room for medical evaluation and treatment. Substance abuse rehabilitation can help you or someone you love struggling with crystal meth abuse. For more treatment program information, call 1-888-319-2606 Who Answers? to speak with a member of our treatment support team.
. Rawson R, Anglin M, Ling W. (2002). Will the methamphetamine problem go away? J Addict Dis 21: 5-19.
. Urbina A, Jones K. (2004). Crystal methamphetamine, its analogues, and HIV infection: medical and psychiatric aspects of a new epidemic. Clin Infect Dis 38 (6): 890-894.
. Lynch J, House MA. (1992). Cardiovascular effects of methamphetamine. J Cardiovasc Nurs 6(2): 12-18.
. Albertson TE, Derlet RW, Van Hoozen BE. (1999). Methamphetamine and the expanding complications of amphetamines. West J Med 170: 214-219.
. Richards JR, Brofeldt BT. (2000). Patterns of tooth wear associated with methamphetamine use. J Periodontol 71(8): 1371-1374.
. Venker D. (1999). Crystal methampetamine and the dental patient. Iowa Dent J 85:34.
. Cho AK, Melega WP. (2002). Patterns of methamphetamine abuse and their consequences. J Addict Dis 21(1): 21-34.
. Substance Abuse and Mental Health Services Administration (SAMHSA). (2015). Results from the 2014 National Survey on Drug Use and Health: Volume I. Summary of National Findings. Rockville, MD: Office of Applied Studies, SAMHSA.